A part from inebriating her guests with a scrumptious pre-show bowl of pure chocolate mousse, Angela Missoni also treated them to a read of her Missoni Moments newspaper, which gave a recipe for an orange fennel salad amongst other juicy tidbits. It wasn't just a gourmand afternoon at Missoni (although that is never a problem for us). The four-page mini sheet also gave a clue into the collection in a photograph of a shaggy carpet that informed the majority of the pattern work on the clothes this season. The broken puzzle piece configuration of the carpet, which featured oversized shards of white trimmed dusty colours, was a smooth move for Missoni this season. It gave a graphic edge to the clothes and looked especially alluring on long, full circle skirts, or on ribbed knit dresses that fell like a column to the floor. 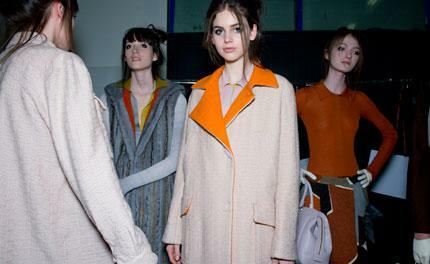 Missoni played with blocks of colour throughout, tossing in aqua astrakhan hues over coats, red ribbed cuffs on dresses, or egg yolk yellow curled lambs wool on the earflaps of wool caps. The house's signature zigs and zags came abstracted this season in bright mandarin and rust, while pops of citrus tones was scattered in slivers of plastic appliqués across dress fronts. The mood, however, was playfully boyish as cropped cargo pants, track pants, parkas and degrade crew neck sweaters all built towards an off-duty, sporty uniform. Soft, fleecy fabrics aided Missoni in achieving cosy silhouettes, and when they clung to the body such as on ribbed tube dresses or thermal style tops, they came in striking intarsia colour patterns.